Phil Searfoss, a member of the Dragon*Con Technical Operations (TechOps) staff passed away yesterday morning. Phil was a friend of many people at Dragon*ConTV, and even officiated the wedding of TechOps staffers Thomas & Barrie Kerns. He will be missed. Taken 11-9-2007 @ the Five Spot in Atlanta, GA by Amy. 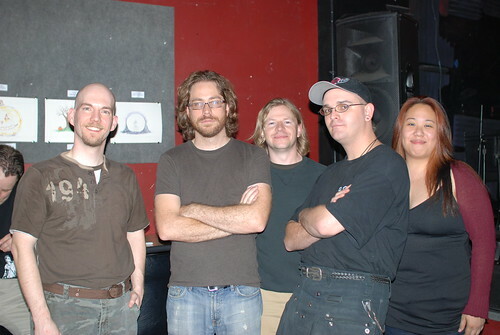 L to R: Stephen (zombie action star), Jonathan Coulton (nerd troubadour), Brian (makes Stormtrooper videos in his basement), Crispy (once choked with a Wii-mote in my living room), Asai (hates having her photo posted on the Internet … sorry).